Video Poker is a variant of the normal five-card draw poker that is played on a digital console, which more or less looks the same a slot machine. Playing a video poker game is easy and almost similar to playing a normal poker game. The main difference between the two is that there are no other players in a video poker game, so you are actually competing against the computer and not against any real player. If you are looking forward to becoming an expert in this game, let me tell you that there is no shortcut to that. Just like any other skill, you can become a video poker expert only by learning and practicing the game. Here are some tips to help you get started. To start with, let’s find out how the video poker is actually played. You choose an online/offline video poker machine and start playing. Just like in a normal five card draw poker, you will be dealt five cards. You can choose to keep (hold) as many cards as you like and discard the remaining. You can select the cards that you would like to keep either by clicking on the cards or by clicking on the hold button for the particular cards. Your discarded cards will automatically be replaced with new ones to form a new five-card hand. This hand will determine whether you win this round or not. If your new hand has a combination that matches one of the card combinations on the pay table, you win and are paid according to pre-decided payouts. One thing to remember while playing video poker is that the payouts may vary depending on the amount of money (number of coins) you choose to play per hand. Most video poker machines will outline the payouts that you can win in various situations in the pay table. It is important to check this table to get an idea of the amount you can win for different kinds of bets. So, now you know how to play the game and what you are getting into when you decide to sit at that video poker machine in a casino. Let’s now discuss the basic hands in a video poker game. The following are the most important video poker hands you should know about. Royal Flush: This is the best poker hand you can get and has the highest winning payout. The five-card hand must consist of – a Ten, King, Queen, Jack and an Ace, with all cards must be of the same suit. Four of a Kind: A hand that consists of four cards with the same number and one different card. Flush: A poker hand consisting of five cards, all of which are of the same suit, irrespective of the card ranks. Three of a Kind: A hand in which three of the five cards are of the same rank and two are different. Pair: A poker hand where exactly two cards are of the same rank and the remaining three others. Straight Flush: A hand with all five cards of the same suit and in numerical sequence. For example – 2d, 3d, 4d, 5d, and 6d. Full House: A poker hand in which three of five cards are of the same rank and the remaining two cards are of another same rank. Straight: A hand that consists of five cards which are in numerical sequence, irrespective of the card suits. Two Pair: A poker card in which there are two groups of two same rank cards (pairs) and one other card. High Card: A hand that doesn’t have any pairs or straights or flush. The value of such a poker hand is determined by the rank of the highest card in the hand. 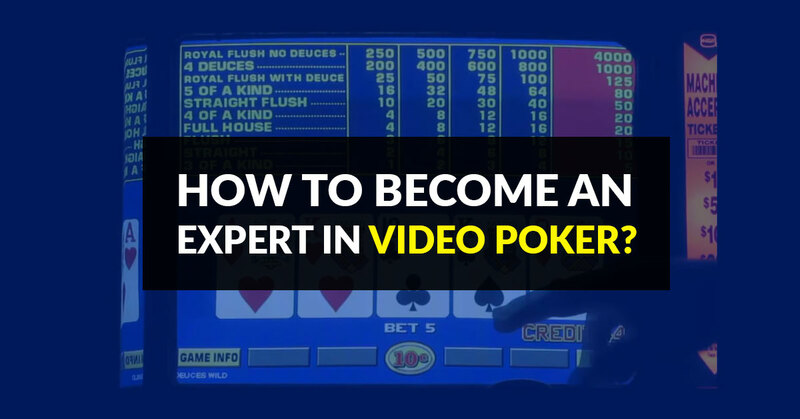 This is everything you need to know about video poker in order to get started at it. However, if you wish to become an expert in the game, you need to practice, a lot. Video poker is better in that once you make a hand in this game, you will surely win it, unlike a normal poker game where you can lose even after achieving a full house.